Located in northeast Phoenix near the Scottsdale boundary, this 316-acre desert oasis features views of the McDowell Mountains and offers holidays for golfers, couples, and families. Desert Ridge Marketplace is only a half-mile away. Located in Desert Ridge, this hotel is within 1 mi (2 km) of Desert Ridge Marketplace and Musical Instrument Museum. Mayo Clinic Hospital and Tournament Players Club (TPC) of Scottsdale are also within 6 mi (10 km). Located in Desert Ridge, this property is within 3 mi (5 km) of Desert Ridge Marketplace, Musical Instrument Museum, and Mayo Clinic Hospital. Kierland Commons and Tournament Players Club (TPC) of Scottsdale are also within 6 mi (10 km). Located in Desert Ridge, this hotel is within 3 mi (5 km) of Desert Ridge Marketplace, Musical Instrument Museum, and Mayo Clinic Hospital. Tournament Players Club (TPC) of Scottsdale and Reach 11 Sports Complex are also within 6 mi (10 km). 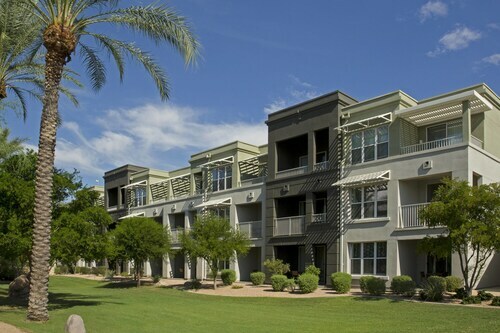 Located in Desert Ridge, this apartment building is within 3 mi (5 km) of Desert Ridge Marketplace, Musical Instrument Museum, and Mayo Clinic Hospital. Kierland Commons and Tournament Players Club (TPC) of Scottsdale are also within 6 mi (10 km). Located in Desert Ridge, this resort is within 3 mi (5 km) of Desert Ridge Marketplace, Musical Instrument Museum, and Mayo Clinic Hospital. Tournament Players Club (TPC) of Scottsdale and Reach 11 Sports Complex are also within 6 mi (10 km). This villa is located in Phoenix (Desert Ridge), close to Desert Ridge Marketplace, Musical Instrument Museum, and Mayo Clinic Hospital. Area attractions also include Kierland Commons and Westworld of Scottsdale. This family-friendly vacation home is located in Phoenix (Desert Ridge), close to Desert Ridge Marketplace, Musical Instrument Museum, and Mayo Clinic Hospital. Area attractions also include Kierland Commons and Scottsdale Quarter. 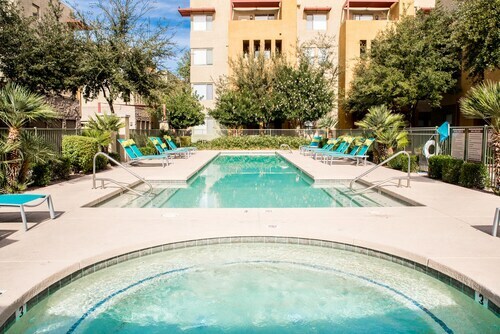 This family-friendly Phoenix condo resort is located in the suburbs, within 2 mi (3 km) of Desert Ridge Marketplace and Musical Instrument Museum. Mayo Clinic Hospital is 2.4 mi (3.8 km) away. 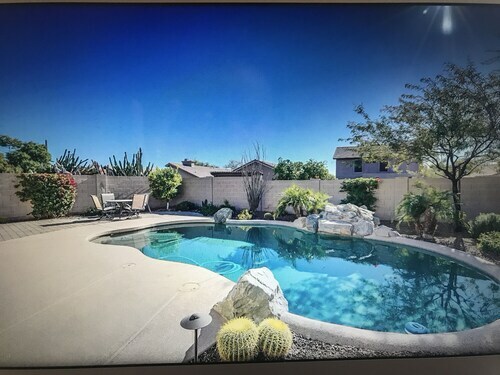 This vacation home is located in Phoenix (Desert Ridge), close to Desert Ridge Marketplace, Musical Instrument Museum, and Mayo Clinic Hospital. Local attractions also include Reach 11 Sports Complex. 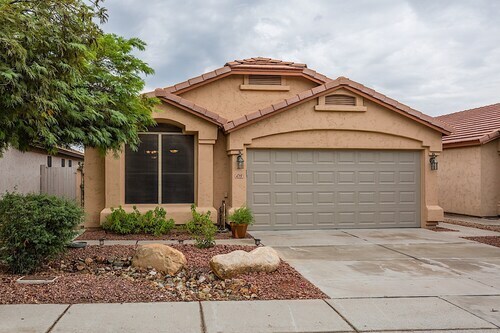 Located in Desert Ridge, this vacation home is within 3 mi (5 km) of Desert Ridge Marketplace, Musical Instrument Museum, and Mayo Clinic Hospital. Tournament Players Club (TPC) of Scottsdale and Reach 11 Sports Complex are also within 6 mi (10 km). This resort is located in Phoenix (Desert Ridge), close to Desert Ridge Marketplace, Musical Instrument Museum, and Mayo Clinic Hospital. Area attractions also include Kierland Commons and Westworld of Scottsdale. Why waste time thinking about it? Desert Ridge Marketplace was made to be seen. To experience it firsthand, head over to Phoenix, the capital of the state. There's a nice range of 5 accommodations that are within 2 miles (3 kilometers) of Desert Ridge Marketplace, but it's still a smart idea to book ahead of time. Only 0.6 miles (1.0 kilometer) away, you can spend your nights at the Marriott's Canyon Villas. 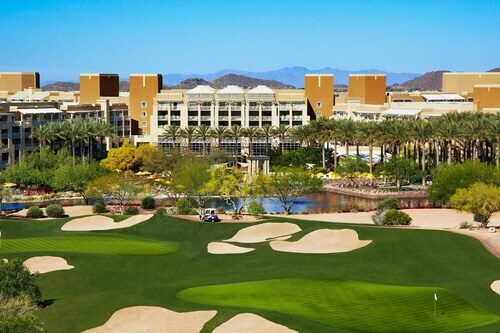 Two other places are the JW Marriott Phoenix Desert Ridge Resort & Spa, 0.5 miles (0.8 kilometers) away, and the Residence Inn by Marriott Phoenix Desert View at Mayo Clinic, 1 mile (2 kilometers) away. Simple but comfortable rooms at budget rates. That is exactly what you will find when you stay at one of the inexpensive hotels here. 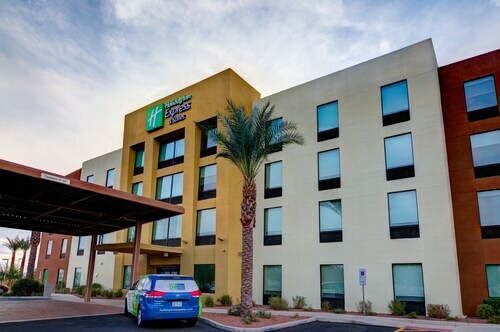 If you aren't quite sure where to start, take a look at the Sleep Inn at North Scottsdale Road and the Extended Stay America - Phoenix - Scottsdale - North. The Private Vacation Homes – Phoenix is a fantastic option where you'll be able to pamper yourself. You also won't have to walk too far, as it's a mere 0.5 miles (0.8 kilometers) away. There is nothing better than roaming around somewhere new to stimulate your appetite. Once you've visited Desert Ridge Marketplace, you can refuel a short walk away, at Mimi's Cafe. Still feeling hungry? California Pizza Kitchen at Desert Ridge is also close-at-hand and offers a more substantial eating experience. You'll laugh and smile when you chat about the day while enjoying an a glass of your favorite drop at Majerle's Sports Grill, also just a short jaunt away. Spend a couple of hours or more honing your golfing skills at Wildfire Golf Club. The magical world of music will be unveiled to you at Musical Instrument Museum. Enjoy a trip through the transport history of the local area at Penske Racing Museum, a fun excursion for the whole family. At Kierland Golf Club, members readily gather for a drink while clearing their schedule for a few easygoing activities. Spend some time practicing your swing at Grayhawk Golf Club. How Much is a Hotel Room in Desert Ridge Marketplace? Hotels in Desert Ridge Marketplace start at $101 per night. Prices and availability subject to change. Additional terms may apply.